This month marks the 25th anniversary of the designation of the USS Intrepid as a national landmark. The famous aircraft carrier is permanently moored at West 46th Street and houses the Intrepid Air and Space Museum. If you are planning a trip to New York City, or just happen to be on the West Side of Manhattan, take a look. You won’t be disappointed. As part of the Mayor’s 15-point plan, the City has launched the Snow Complaint Map. 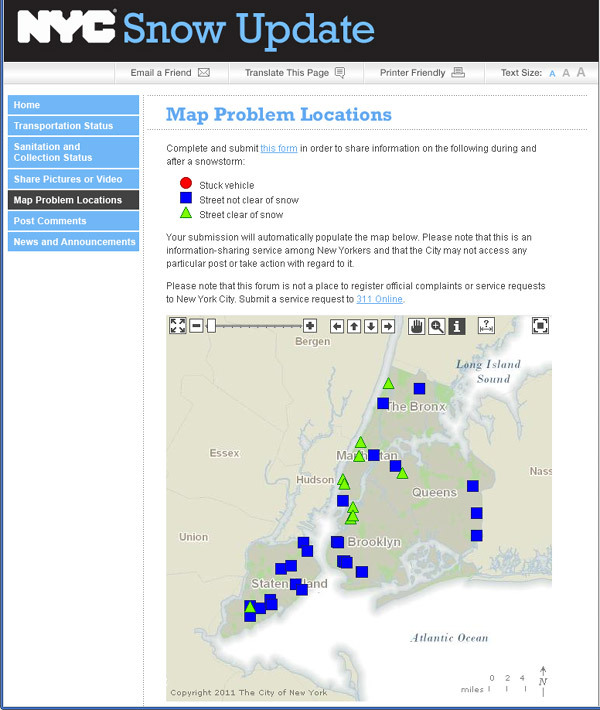 Developed using DoITT GIS’ Webmap framework, this application provides the citizens of New York City the ability to submit stuck vehicle, street not clear of snow and street clear of snow conditions and have them displayed on a map. The mapping application can be accessed from the City’s Snow Update website. Several news outlets, including the Wall Street Journal and Time Magazine have written stories about Egypt’s recent threat to reclaim Cleopatra’s Needle, the famed obelisk in Central Park. According to the NYC Department of Parks and Recreation, The 71-foot tall icon is the oldest man-made structure in the park. If you want to go and take a look at it for yourself, it is located directly behind the Metropolitan Museum of Art near the 79th Street Transverse.